Throughout March, there has been so many beauty related products that I've loved; to the point where I felt like I has so many things that I'll need replace sometime soon, oops. 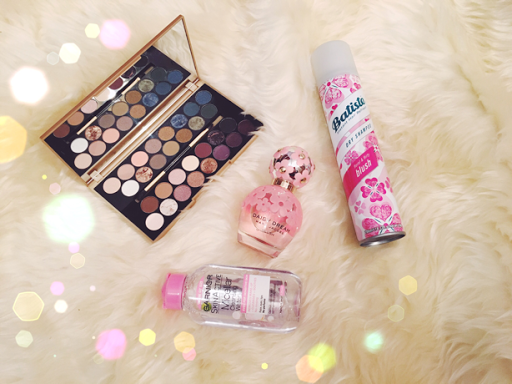 My absolute favourite right now has been the Batiste Dry Shampoo in Blush, which I snapped up a huge fan in Superdrug for about £3, less than half the RRP. I've fallen in love with the fresh floral scent it gives to my hair. I have a habit of showering in the evenings so overnight my hair looses its freshness a little, but bit a quick spritz of Blush my hair definitely feels fresh and clean again but I head off to work for the day. A massive hate of mine is having greasy hair but I love sleep so using dry shampoo is a great way to have the best of both worlds for me. I've also been loving the Garnier Skinactive Micellar Cleansing Water for sensitive skin. I bought mine for the bargain price of £1 in Poundland and honestly my skin feels so much better since I started using it. It is a bit of a faff to use all the time but my skin definitely has had less blemishes since I started using it, which is fantastic. There was always going to be a perfume on this list because if you know me or read my blog then you'll know how much I'm in love with perfumes. Lately I've been loving Marc Jacobs Daisy Dream Blush because not only does it smell amazing it's also so lovely to look at, although it's fairly expensive priced at £54. The pink shades of the bottle and fragrance is lovely and feels so feminine and soft. 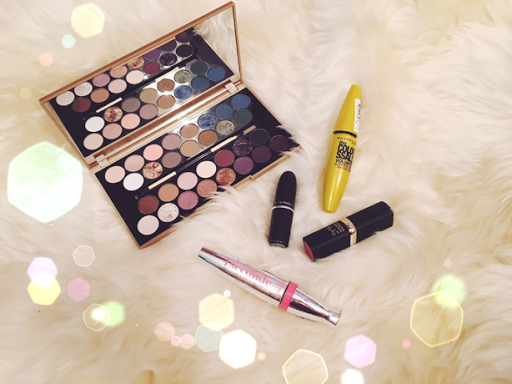 I've also been loving the Fortune Favours The Brave eyeshadow palette by Makeup Revolution, which also looks lovely in person and for blog shots. For £9, it's much cheaper than Daisy Dream Blush but it also feels like good quality or that price. What I love about the shadows is that they're not strictly one colour, they have shades running through the overall shade so it makes blending on the eyes so much easier. There's also such a range of different shades within the palette that it I feel like there is so much potential for different looks with this palette. Plus, it looks lovely in photographs which is always a must for any blogger! I've been obsessed with two Sleek highlighters for a couple of months now, but I feel like it's only during this month that I've managed to master the art of putting highlighter on my face successfully... I'm such a blogging fail, haha. Sleek Solstice needs literally needs no introduction as it seems like every blogger on the planet is in love with it, but I do prefer the Sleek Midas Touch palette, which (much to my disappointment) is actually a limited edition so will be super difficult to track down soon, sadly. For the insane price of £10 each, you do get three powder shades and one cream shade in each palette, so there is a shade to suit everyone. I'm not massively keen on the blue or purple shades, but considering I use the other shades regularly I've definitely gained more than my money's worth and they're great glows shades without looking too shiny, which I love. I definitely prefer more of a natural highlight for everyday make up looks. 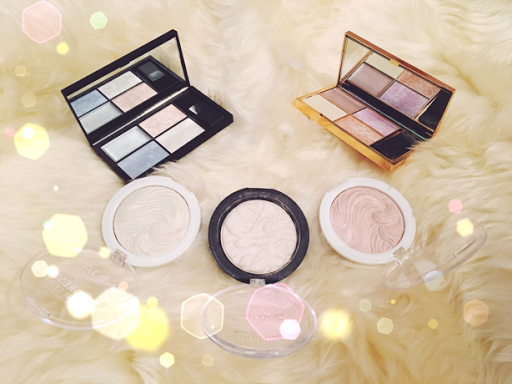 Earlier in the month I popped into Superdrug, (surprise, surprise) and bought three highlighters; Ever Glow Lights by Makeup Revolution, Iridescent Gold and Pink Shimmer by MUA. All three of these highlighters are an absolute steal at £3 and are so pigmented it's amazing! I feel like I simply dust the products against my skin and I'm shining bright! Lastly, these four products are my all time favourites and I'm forever using them to the point that I really, really need to get some spares for when I run them to the ground (which is likely to be very soon!). In terms of mascara, I've been loving the Bourjois Volume One Seconde for the past year or so and I do get some lovely compliments on my lashes whenever I wear it, which is such a fantastic confidence boost. It's fairly pricey at £9.99, but I would say it's worth every penny as it lengthens and separates lashes so well I've been asked if I'm wearing falsies! It's also super black, which I adore in any mascara. Similarly, this month I've rediscovered a love for Maybelline The Colossal Volum Express which I had worn for literally years until I was converted to Bourjois; it's cheaper, at £7.99 but just as good. I think it's more of an everyday mascara as it doesn't feel so heavy on my eyes but at the same time I love it just as much. It's so black (I use the 100% black version) and the fiber brush works so, so well for me as it doesn't scratch at the lashes at all. Both of these mascaras are stunning and I don't need to use eyelash curlers beforehand with either of them, which is great as low maintenance is always great, especially if you're like me and forever running late!